You’ve heard it a hundred times before. Brush your teeth twice a day and floss daily. Well, that bit of advice is the main way to prevent cavities. But how do cavities form in the first place? What is the cause of a cavity? At Family Dentistry of Windsor, the practice of Dr. Stephen D. Lipman, cavities are treated before they begin, not only after they have formed. Our Windsor cosmetic dentist believes that knowledge is power, so we educate patients on how exactly it is that cavities are formed and what patients can do to prevent them. Basically, it all boils down to tooth decay. Tooth decay is what eats away at enamel, the outer coating of the tooth, and tooth decay can also affect the inner part of the tooth called dentin. What leads to tooth decay, you ask? The remainder of starch and sugar-rich food particles on the teeth will eventually do it. Bacteria in the mouth love to feast on such food particles, turning them into acids. This acid, coupled with bacteria and saliva in the mouth, will turn into plaque. (Plaque is that substance that sticks to your teeth.) If left on the teeth for too long, plaque destroys tooth enamel and dentin, creating the hole you know as a cavity. Of course, the best treatment for a cavity is prevention through daily brushing and flossing. Existing cavities treatment depends on the extent of the decay. For a minor cavity, Dr. Lipman drills a hole into the cavity, cleans out decay, and fills the void with a tooth-colored or white filling made of composite resin. When a moderate amount of decay has affected the back teeth, inlays and onlays may be the appropriate treatment option. 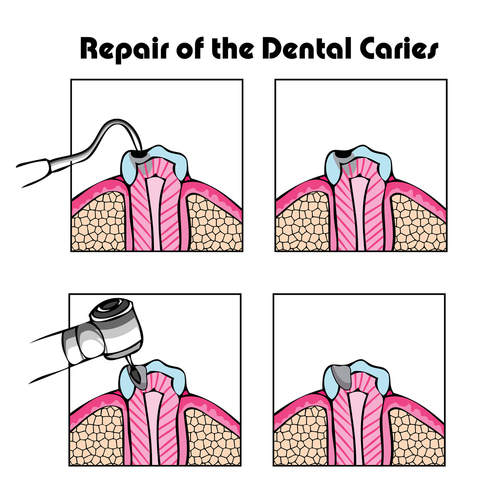 These restorations are custom made to fit over and fill in the missing part of tooth. Inlays are used when the decay affects only the indented portion of the tooth; onlays are used when the decay extends up to the cusps of the teeth. The advantage of inlays and onlays is that they provide more support to the rear teeth, which withstand more force and pressure than the front teeth. When decay is more extensive and the inner tooth structure is damaged, the decayed area will need to be removed during root canal therapy. The patient will then be fitted with a dental crown, or custom tooth-shaped cap. If Dr. Lipman deems the tooth will need to be extracted, dental implants may be needed to replace the tooth. For our patients in Windsor, dental implants are a durable and effective tooth replacement option. The treatment involves the insertion of a titanium post in the jaw bone. Once fused to the bone, the post has to be covered with a natural looking prosthetic tooth made just for you. Would you like to know more about cavities and the treatment options available at our practice? Please contact our dental practice based in Windsor, Connecticut with any questions or to schedule a routine care appointment today!